Receiving a Notice of Intent to Deny (NOID) when applying for a visa or permanent residence is an especially alarming event. If you are an employee waiting on an employment-based immigrant or nonimmigrant visa, you may believe your opportunity is gone. If you are an employer and you receive a NOID on a petition filed for a potential employee, you may think it is time to start the search for talent all over again. However, receiving a NOID does not mean that your visa petition is doomed. You can successfully respond to a Notice of Intent to Deny, and the visa applicant can ultimately receive the visa they are seeking. If you receive a Notice of Intent to Deny, it’s important to take action quickly. NOID responses must be submitted within 30 days. Getting a NOID in your case doesn’t necessarily mean that your case will be denied – it does mean that USCIS has determined that your case has an issue that needs to be addressed. If you do not respond to the NOID and address the concerns in it, the case will be denied. If you receive a NOID, figuring out how to respond and what evidence and information to include is key. Your NOID response is often the last opportunity you have to communicate with USCIS about your case, so it’s important to ensure that you submit the best response possible. An experienced immigration attorney can help you prepare a NOID response to address the issues USCIS outlines in your NOID. An experienced Houston immigration lawyer can develop a response to a Notice of Intent to Deny and put the visa application process back on the right track. 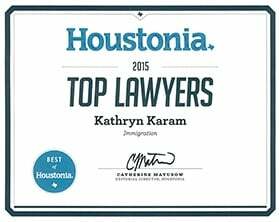 Kathryn Karam has successfully responded to NOIDs for those seeking visas in the Houston area. She can assist you if you or a potential employee have received a Notice to Intent to Deny. Being informed that the U.S. Citizenship and Immigration Service intends to deny your visa petition may seem like an insurmountable problem, but Kathryn Karam prides herself in developing creative and innovative solutions to difficult matters. Call today at (832) 582-0620 to schedule a consultation. Karam Immigration law serves people and employers throughout the Greater Houston area, including in Cypress, The Woodlands, Clear Lake, Bellaire, Sugar Land, Greenway Plaza and the Energy Corridor. Officers at U.S. Citizenship and Immigration Services review visa petitions. They are to do their best to determine whether the applicant is eligible for the visa for which they are applying. The applicant did not sufficiently prove that he/she has the required education or experience for the job he/she is being offered. The Notice of Intent to Deny is not a denial. It means an application will be denied if the specific grounds on which the officer plans to deny the petition are not sufficiently overcome. Many times, the information on which the officer is basing his or her intent is incomplete, and more information needs to be provided to show that the applicant is indeed eligible. The officer may have misinterpreted or misunderstood information. It is even possible for an officer with a heavy caseload to confuse information from other petitions. A response to a NOID will address each ground for denial the NOID states, arguing that the applicant is eligible and/or providing new evidence of his/her eligibility. If you are an employer and you receive a NOID in a temporary work visa petition, or you have filed an employment-based immigration petition and receive a NOID, an employment-based immigration lawyer can draft a response that carefully and sufficiently responds to each point made. If you or your potential employee receives a NOID, it is important to act quickly. Once a person receives a NOID, they have only 30 days to respond. If you receive a Notice of Intent to Deny in your marriage-based green card case, it is something you should take very seriously. If you do not respond to the NOID, your marriage-based case will likely be denied. You must respond, and you have the best chance of getting your case approved if you prepare and submit the best evidence available in your response. There is no need to feel pessimistic if you or a potential employee receives a NOID. A Notice of Intent to Deny can be successfully rebuffed, particularly if you have a Houston immigration lawyer on your side who understands NOIDs and has dealt with them before. Kathryn Karam has worked with Houston-area employers and individuals to fight Notices of Intent to Deny. Call today at (832) 582-0620 to schedule a consultation.